The Web Links Category Manager allows you to manage categories that can be used to classify Web Links. Select Components → Weblinks → Categories from the drop-down menu of the Joomla! Administrator Panel, or select the "Categories" link on the Web Links Manager screen. 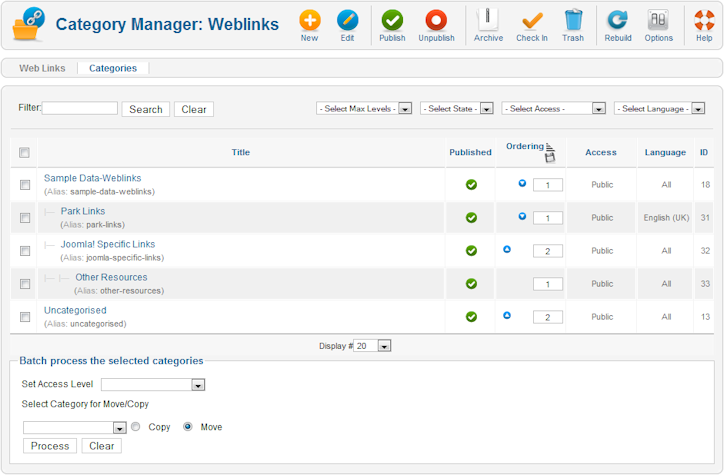 The Web Links Category Manager is where you can edit existing Web Links Categories and create new ones. Note that Web Links Categories are separate from other Categories, such as Categories for Articles, Banners, News Feeds, and Contacts. From this screen, you can also navigate to the Web Links Manager screen. Select Max Levels. Use the drop-down list box to choose how many hierarchical levels to show in the list. This section lets you modify all currently selected (checked) items in one batch operation. Set Access Level. Select an Access Level to be applied to all selected items. See User Access Levels for more information. Select Category for Move/Copy. Select a target category where selected items should be moved or copied. Copy. Select this option to copy selected items to the specified category. Move. Select this option to move selected items to the specified category. Process. Proceed with the specified changes on all currently selected items. Clear. Reset all options in this section. Web Links. Press this link to go to the Web Links Manager page.